McLeod Performance billet steel flywheel for race and demanding street applications that require greater strength than that of standard cast flywheels. Stock cast flywheels can develop cracks after use in high performance applications and can eventually lead to catastrophic failure. Billet steel flywheels resist this and so are often specified by many race organisations. A wise choice and cheap insurance for high output engines. 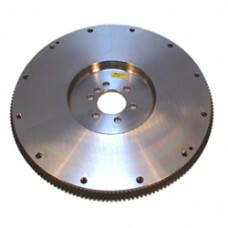 Fits Chevrolet LS engine (6 bolt fixing) and is .400" thicker than MCL460530 and stock LS flywheel. 168-tooth ring gear, accepts 11& 12" B&B diaphragm 3/8" shoulder bolt and 12" LS diaphragm metric clutch covers.